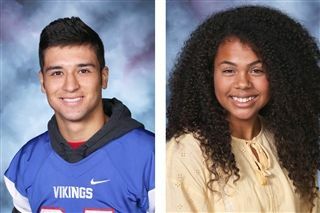 Our Viking Christian Leaders for the month of January are Jason Bonow ('19) and Bria Wigley ('20). A Viking Christian Leader exemplifies the culture of Christian leadership at WLHS by applying their God-given gifts in service to others. Jason is a member at Trinity Lutheran Church in Waukesha. Before Wisconsin Lutheran High School, he also attended Trinity Lutheran School. Currently a senior at Wisco, Jason has participated in Football (9,10,12), Wrestling (9, 10, 11, 12), and Track and Field (9, 10, 11, 12). He also was selected for Badger State Boys his junior year. Jason helps out at his church assisting with Vacation Bible School, assistant coaching, and in Youth Group. In his spare time, Jason enjoys sports, Netflix, and striving to become an entrepreneur. After graduation from Wisconsin Lutheran High School, Jason plans to attend college and major in Business. Jason has been nominated for Viking Christian Leadership this month for his exemplary character, commitment to excellence, and leading with Christian spirit. Jason characterizes Christian leadership as having Christ-like humility. Bria is a member at Atonement Lutheran Church, Milwaukee. Before Wisconsin Lutheran High School, she also attended Atonement Lutheran School. Currently a junior at Wisco, Bria has participated in volleyball (9,10,11), basketball (9,10), and track and field (9,10). She has been in choir (9, 10) and this is her first year in Wisco Kids. She also has participated on Student Council (9), and was selected for the Civil Rights tour her sophomore year. Bria helps at her church and school by canvassing and being a Sunday greeter, and also running concessions for grade school games. In her spare time, Bria enjoys playing volleyball, singing, and spending time with family. After graduation from Wisconsin Lutheran High School, Bria plans to major in pre-med or nursing. Bria has been nominated for Viking Christian Leadership this month for her service to others, academic excellence, and optimistic spirit. Bria characterizes Christian leadership as leading by example through hard work, getting good grades, and having a strong faith.